The Great Lakes regional official who handled the Flint, Mich., water crisis for the Environmental Protection Agency tendered her resignation, the agency confirmed. Regional Administrator Susan Hedman offered to resign by Feb. 1. Recent emails have shown that Hedman was aware of the bankrupt city’s lead-contaminated water early last year but deferred to state and local authorities. “Susan’s strong interest is ensuring that EPA Region 5’s focus remains solely on the restoration of Flint’s drinking water,” EPA Administrator Gina McCarthy said in accepting the resignation. McCarthy also spoke and sent a letter to Michigan Governor Rick Snyder highlighting recommendations for next steps in addressing the health and water supply crisis and warning of “inadequate transparency and accountability in regard to test results” under the operative Safe Drinking Water Act Emergency Order. The letter was copied to Flint Mayor Karen Weaver. Both the governor and mayor committed to prompt action. McCarthy also committed to improving enforcement of the agency’s Lead and Copper Rule for water safety and is “actively considering revisions” after EPA staff in Michigan met with local stakeholders this week, her statement said. McCarthy also asked the EPA inspector general to conduct a program evaluation of the Great Lakes Region’s public water supervision program under the Safe Drinking Act. That office agreed. 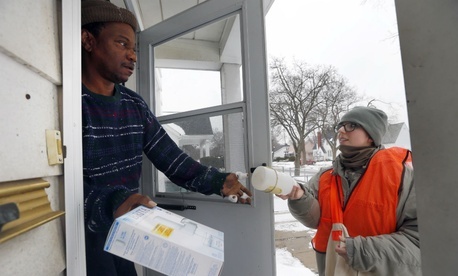 Meanwhile, an array of other agencies have swept into action to contain the Flint crisis. The Health and Human Services Department is now the lead agency coordinating responses to supply bottled water and otherwise help residents address the health effects of the poisoned water. HHS is working with the Federal Emergency Management Agency in mobilizing assistance from the Small Business Administration and the departments of Housing and Urban Development, Education and Agriculture.